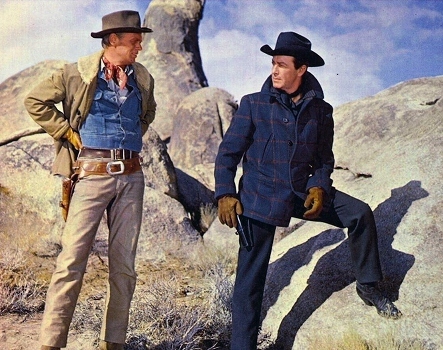 Based on the 1956 novel by Marvin H. Albert, director John Sturges' The Law and Jake Wade (1958) is a minor entry in comparison to his later efforts like The Magnificent Seven and The Great Escape...but it's still a enjoyable little film in its own right. The story couldn't be simpler: Marshal Jake Wade (Robert Taylor) is a former Confederate soldier turned lawman who, not surprisingly, has a few skeletons in his closet. Jake secretly breaks his former partner Clint Hollister (Richard Widmark) out of jail before reporting for duty one night, believing this "good deed" will repay a debt owed to Clint from their earlier days. His fiancée Peggy (Patricia Owens) is kept in the dark at first, but she learns the truth once Clint and his men capture them: it turns out that Jake buried a small fortune somewhere during one of their old jobs together, so Jake and his lovely bride-to-be are forced at gunpoint to join the treasure hunt. 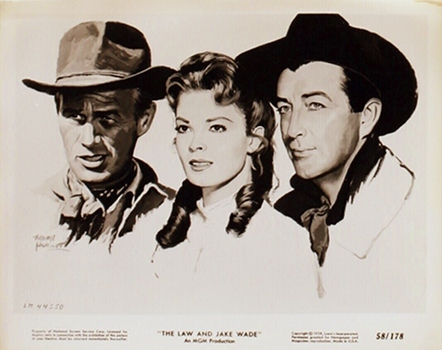 The Law and Jake Wade plays it smart by not making its title character a faultless hero: he's downright tough to root for at times, both for hiding his past from Peggy and being dumb enough to break someone out of jail mere hours before putting on a tin star. Yet he still seems regretful of such obvious mistakes as the extended hostage situation treads on (and not just because he got caught), making several smart moves while placing Peggy's safety above his own. The trouble is, Clint always seems one step ahead of Jake: he knows his former partner well, keeps him on a tight leash, and has brought enough men to make sure that there's no funny business. So while the final stretch of The Law and Jake Wade unfortunately takes a few convenient turns in favor of our quasi-hero, the journey still manages to outshine its destination. It's largely due to Richard Widmark's enjoyable performance as Clint, as his ability to control the cat-and-mouse dynamic ultimately saves what might otherwise be an average production. The Law and Jake Wade rarely digs below the surface and therefore doesn't warrant as much replay value, but it's still enjoyable while it lasts. 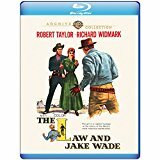 First released on DVD by Warner Bros. in 2008 (both as a stand-alone disc and as part of their Western Classics Collection), The Law and Jake Wade has been given a courtesy bump to high definition as part of the Warner Archives line. This is a good-looking disc apparently sourced from a brand new 2K scan of the film, paired with lossless audio but no additional bonus features---just the trailer, unfortunately. One would think that a similar themed multi-disc collection of WAC titles would be a no-brainer...but for now, it looks like we'll get titles like Ride the High Country, Man in the Wilderness, and Bad Day at Black Rock (also by Sturges) one at a time.
. THIS SPACE FOR RENT. E-MAIL [email protected] FOR DETAILS. Presented in its original 2.35:1 aspect ratio, The Law and Jake Wade looks better than ever thanks to a sparkling new 2K scan and 1080p transfer that easily outshine the 2008 DVD. The film's excellent CinemaScope framing leads to plenty of memorable shots (although a lot of feet and hooves are cut off, so maybe it was overkill), with the Blu-ray squeezing out a strong amount of image detail, depth, texture, and good color saturation that looks most impressive during the frequent outdoor sequences. Dirt and debris are basically absent, and no other glaring imperfections (including noise reduction, compression artifacts, or banding) could be detected either. It's a good-looking disc overall that would only look better if the original camera negative was used for this new scan. The audio is presented in its original DTS-HD Master Audio mono format and defaults to a two-channel spread, and what's here definitely reflects the era in which The Law and Jake Wade was released. Dialogue and music are clear but not especially dynamic, there's modest depth at times, and the higher end feels more than a bit harsh on occasion. Still, it sounds exactly like a 59-year-old Western ought to, and I'd rather have flat mono than a faux-surround "upgrade" and day of the week. Optional English subtitles are included (again in ALL CAPS, an obvious distraction at times), which makes a few moments of softer dialogue easier to decipher. Warner Archives' standard interface (virtually identical to the 2008 DVD) is clean, simple, and easy to navigate. Separate options are included for subtitle setup and bonus features, which are limited to the film's no-nonsense Theatrical Trailer (2 minutes). This one-disc release is packaged in a standard blue keepcase with poster-themed artwork and no inserts of any kind. DON'T YOU JUST LOVE INVISIBLE TEXT? NO ONE CAN SEE IT! The Law and Jake Wade is still very watchable almost 60 years later, whether you're a complete newcomer or have seen it several times before. It hasn't aged particularly well in certain respects but maintains a good amount of suspense and intrigue throughout, while the performances---especially Richard Widmark as the scheming Clint---are capable all across the board. It's a visually strong production whose only fundamental weakness is a story that doesn't dig much below the surface (hence the lower replay value)...but if you're looking for a no-nonsense Western with a few twists along the way, you could certainly do a lot worse. Warner Archives' Blu-ray offers a nice upgrade over their parent company's 2008 DVD, mainly in the form of a solid A/V presentation based on a brand new 2K scan. Newcomers may want to rent it first, but established fans should consider a purchase. Mildly Recommended.